We recently broke the news that award-winning, Denver-based restaurant group Punch Bowl Social has targeted San Diego's East Village for the launch of their first Southern California location. Founded by entrepreneur Robert Thompson, the restaurant group has also announced that it has appointed southern culinary sensation and celebrity chef Hugh Acheson to serve as the burgeoning company's culinary partner. In this newly created role, Acheson will quarterback the ongoing culinary direction of the growing restaurant concept. Over the past several months, Acheson has been developing his new menu at Punch Bowl Social – a nearly complete overhaul of the food offerings - which will be introduced at all Punch Bowl Social locations beginning August 26th. 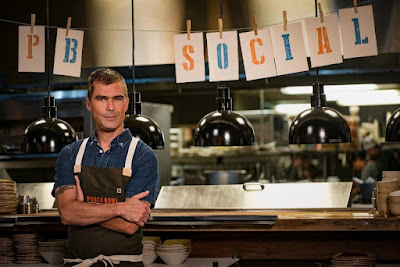 The partnership with Acheson, a well-known and nationally admired chef, is a game-changer for the brand and is the crescendo in Punch Bowl Social's larger culinary vision. Acheson's partnership announcement comes on the heels of the recent appointments of Denver chefs Chris Cina and Matt Selby, further strengthening the culinary team as Punch Bowl Social continues to expand nationally. Through the collaboration, Acheson will develop all seasonal menu changes, create daily green plate and blue plate specials offered at all locations, and provide guidance and leadership on the Punch Bowl Social management team. "Hugh's style is nostalgic for me, bringing me back to my roots growing up in Mississippi. He blends modern cooking techniques and trends with an authentic, southern culinary platform," said Robert Thompson, CEO and founder of Punch Bowl Social. "The partnership with Hugh brings an injection of soulfulness to our menu while providing a consistent, disciplined and innovative approach to our culinary program. With Hugh, we have a seasoned partner who will engineer the food aspect of our business, which is the keystone to our concept's success within the 'eatertainment' category." Athens, Georgia based Acheson, serves as a Top Chef judge and is best known for his unique food philosophy, sourcing local ingredients and preparing food from scratch while taking foods like farro and quinoa and giving them a unique, soulful, southern perspective. He has been named multiple times as the Best Chef Southeast by the prestigious James Beard Foundation, honored as Best New Chef by Food & Wine Magazine and is the author of the James Beard Foundation award winning cookbook "A New Turn in The South: Southern Flavors Reinvented for Your Kitchen," "Pick a Pickle: 50 Recipes for Pickles, Relishes, and Fermented Snacks" and "The Broad Fork, Recipes for the Wide World of Vegetables and Fruits." He also serves as chef/partner of the Athens, Georgia restaurants 5&10, The National, the Atlanta restaurant Empire State South, and The Florence in Savannah. "I have admired Punch Bowl Social's dedication and commitment to a completely scratch kitchen on such a large scale. There is nothing quite like it in the country," said Acheson. "Their original southern inspired menu, design aesthetic of each location and food forward vision provides me with a unique opportunity to help grow and define the culinary program in a way that we hope will inspire other restaurants to focus on food in a similar way." With current restaurants in Denver, Portland, Austin, Detroit, Cleveland and Schaumburg, IL, new locations of Punch Bowl Social will open in Indianapolis and Minneapolis later this year with six more locations in Denver's Stapleton neighborhood, Sacramento, San Diego, Rancho Cucamonga, Chicago and Dallas scheduled to open in 2017 and a Brooklyn location in early 2018.